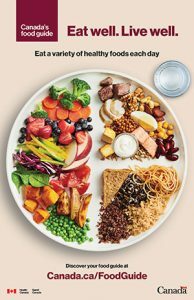 To get the nutrients you need for good health, balance your plate at meals and snacks by using Canada’s new Food Guide plate model. Aim to have half of your plate filled with colourful vegetables and fruit and split the other half of your plate into a whole grain (quinoa, barley, rice, pasta, bread) and proteins (meat, fish, poultry, eggs, beans, nuts, tofu and dairy products). Enjoy water as your beverage of choice. Many of our resources and messages were already in line with the new Food Guide. However we do have some updating to do. Thanks for your patience. Planning ahead will help you eat well. Check out these resources for meal planning tips. Food safety covers many topics. It includes choosing safe food, storing it, preparing it, transporting it and safely handling leftovers. Visit the Health Unit’s Food Safety section to learn the steps for keeping you, your family and your guests safe and healthy when shopping, at home, at school, in the garden and on the go. Food shopping can be an overwhelming experience when faced with thousands of choices. Healthy foods are rich in protein, high-fibre carbohydrates, vitamins and minerals. They are lower in saturated fat, sugar and salt, and are trans fat free. To be a savvy shopper, look at all the foods you eat. While we all choose less healthy foods sometimes, the goal is healthy eating overall. The Shoppers Guide to Making Healthy Food Choices has tips to help you shop for healthy foods and make healthy food choices in each section of the grocery store. It offers information on label reading, nutrients, meal planning and more. Did you know nutrition labels are changing in Canada? Visit Health Canada’s Food Labels website to learn more about these changes and reading food labels. Choosing local food or foods grown closer to home helps create jobs and supports the economy. It helps supports farmers and producers, preserves farmland and protects the environment. Buying local food means it’s fresher. And, when you get to know the people who grow and produce your food, you may feel more connected to what you eat. Visit the Food Safety section for more information on Food Safety at Farmers’ Markets. As of January 1, 2017, all food-service chains with 20 or more locations in Ontario must post the number of calories in the food and drink items on their menus or on display. The Food Safety webpage has information for Food Service Premises Operators. These locations must post the following contextual statement: Adults and youth (ages 13 and older) need an average of 2,000 calories a day, and children (ages 4 to 12) need an average of 1,500 calories a day. However, individual needs vary. Food and drinks give us energy for our bodies. We need energy to fuel our basic body functions and for physical activity. This energy is measured in calories. Calories tell us the amount of energy in a food or drink but do not tell us the amount of protein, healthy or unhealthy fats, sugar, fibre, vitamins or minerals in the food. What does the Contextual Statement mean? This statement is meant to help customers figure out the number of calories they might need in a day and see how their food choices fit to meet these needs. However, individual needs vary based on age, gender, activity level and overall health. There’s more to food than just calories! Food and drinks give our bodies the nutrients and energy we need to live, learn, grow, play and be healthy. Healthy eating can provide an opportunity to enjoy the company of others. Eating a variety of foods, like colourful vegetables and fruit, whole grains, lean meat and alternatives, and lower fat milk and alternatives helps us to get a variety of nutrients. Foods like pizza, cake, cookies, chips, French fries, and pastries are “sometimes foods” as they are higher in salt, sugar and fat. Enjoy these foods in moderation as an occasional treat. Focus on the nutritional content of food and not just calories. The amount of calories in a food or drink does not determine if it is a healthy choice or not. Consider the amount of protein, fats, sugar, fibre, vitamins and minerals in the food or drink. Choosing “sometimes” foods when eating out or at home can fit in a healthy eating pattern. Include these foods in moderation and focus on making healthy choices most of the time. Growing a garden is a great way to have access to a variety of fresh and delicious vegetables and fruit. Research shows that gardeners eat more vegetables and fruit. foodcoreLGL’s Food Inventory lists places to buy plants, seeds and participate in seed exchanges, and has information on starting, growing and expanding a garden. No space for a garden? One solution may be container gardening, where you grow vegetables and plants in boxes on a balcony, deck or window sill. You can grow beets, beans, cabbage, carrots, cucumber, eggplant, green onions, lettuce, collards, bok choy, spinach, kale, tomatoes, peppers, and radishes all in containers. Include herbs in your gardening plans and use them when you cook vegetables or dry or freeze them for use all winter long. Community gardens are another solution. Belonging to a community garden gives you and your family, students, co-workers or neighbours the chance to learn about growing your own food and eat it. Being a part of a community garden can increase your physical activity in nature, introduce you to new people, provide quality family time and can connect you to your community. See the Food Inventory for a list of existing community gardens. Preparing food using mostly fresh ingredients for yourself and others can play a huge role in improving your health. Reducing processed and take-out food will lead to less added salt, sugar and fat. Use the meal planning tips in the Choosing Meals and Snacks section to help to reduce overall food costs. For the steps to keep you, your family and your guests safe and healthy visit the Health Unit’s Food Safety pages. There you will also find useful information on safe food preservation. Learning to cook allows you to make small but important changes to your health, for example replacing salt with other tasty ingredients or using evaporated milk instead of cream in a recipe. Slow cooking is an easy and safe way to cook tasty food. Our Slow Cooker Recipes book is full of many delicious ideas. Join a community kitchen or cooking class to prepare meals and learn with others. Children who cook use creativity; try new foods, and gain independence and confidence. Quality family time comes from preparing food together. Parents and caregivers can help children learn food skills. Kids can stir, mix and help to wash fruit and vegetables. As they get older, they can take on more complicated tasks. Visit UnlockFood.ca for recipes, tips for cooking with kids, “how-to” videos and more. Often older adults or people living on their own don’t want to bother cooking even if they know how. Investigate the seniors’ section at Dietitians of Canada for some helpful ideas on meal planning, cooking and shopping. When it comes to food skills and food knowledge many people we know have a lot to share. Everyone has the right to access healthy and safe food. If you choose to donate food see the Health Unit’s resource Donating Healthy and Safe Food.